The New England Patriots beat the Oakland Raiders 33-8 in Mexico City Sunday for their sixth straight win. 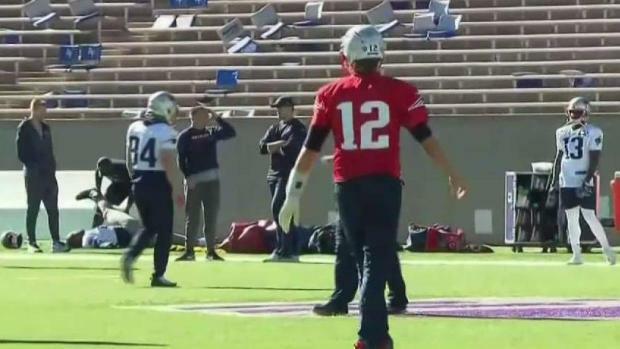 The Patriots’ trip south of the border could be summed up as muy facíl. Tom Brady matched his personal record from 2003 by completing his first 12 pass attempts of the game and finished 30-for-37 overall for 339 yards in a 33-8 rout of the Oakland Raiders at Azteca Stadium in Mexico City. In similar fashion to last week against Denver, the altitude had little to no effect on any phase of the game for the Patriots, now 8-2 on the season. Virtually everything went right for New England, from a defense that forced two turnovers and held the Raiders (4-6) off the scoreboard until the fourth quarter, to an offense that continues to run as efficiently as ever, to another solid showing from the special teams unit. Oakland punted on the game’s opening possession, which may as well have been the end of the game right then and there. Brady took the Patriots on a 15-play, 87-yard drive, the result of which was a 15-yard touchdown catch for Dion Lewis. The New England Patriots (7-2) will face the Oakland Raiders (4-5) on Sunday at Mexico City's Azteca Stadium. New England even threw the Raiders a lifeline on the series with a Rex Burkhead fumble, only for the ball to be scooped right up by Dwayne Allen. The struggling tight end also had a catch on the opening series for the Patriots, giving him a catch in back-to-back weeks after not hauling in a single pass from Brady through eight weeks. Perhaps the most remarkable part of the first drive for the Patriots was that Brady completed a pass to six different receivers, not one of whom was Rob Gronkowski. New England continues to do a great job managing of Gronk and keeping him fresh for the stretch run, where he’ll surely be needed more than ever with Julian Edelman unavailable. Gronkowski had a relatively quiet game with three catches for 36 yards. Danny Amendola and Brandin Cooks also caught touchdown passes from Brady, each throw a different demonstration of Brady’s unique skill set. Leading 7-0 and facing a third-and-goal from the 5-yard line, Brady was flushed from the pocket. Rather than continue to move outside and throw the ball away, he stepped up in the pocket and found Amendola streaking across the back of the end zone to double New England’s lead with 5:23 to go in the first half. Brady dusted off his deep ball on the Patriots’ opening series of the second half, exploiting a miscommunication in the Oakland secondary to find Cooks on a streak route for a 64-yard touchdown pass. The only time it appeared as though the Raiders may have had a prayer in getting back in the game was as the first half wound down and the team entered the red zone for the first time. Derek Carr – who’d already thrown a pick to Duron Harmon thanks to a drop by Johnny Holton – was let down again by one of his receivers. NBC Boston's Raul Martinez makes his prediction on Sunday's Pats-Raiders game in Mexico City. Carr found Seth Roberts down at the 3-yard line before his progress was stopped by Jonathan Jones. But rather than go down, Roberts’ ill-fated fight for extra yardage enabled Marquis Flowers to strip him of the ball. 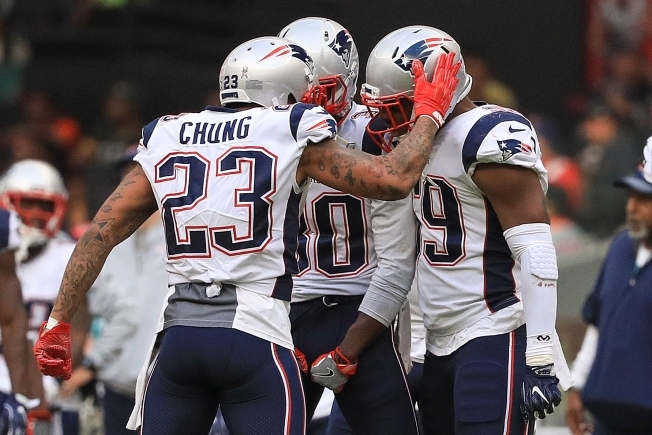 Patrick Chung arrived to recover the fumble and keep the first half shutout intact. Off of the Roberts fumble, the Patriots had only 26 seconds left to work with in the first half. Thanks to a 20-yard run by Lewis on the first play of the drive, Belichick elected to keep pushing the tempo and get Stephen Gostkowski into field goal range. Taking advantage of the thin air of Azteca Stadium – which sits nearly 2,000 feet higher above sea level than Sports Authority Field at Mile High in Denver, even – Gostkowski connected on a 62-yard field goal as the first half expired to send the Patriots into the locker room with a 17-0 advantage. The 62-yard kick was a career-best for Gostkowski, surpassing his 58-yarder from earlier this season vs. Carolina. Gostkowski was 4-for-4 on his field goal attempts, including a second kick from over 50 yards, and was also perfect on his PATs. Brady’s 81.1 completion percentage was the eighth-best of his career for a single game in the regular season. Both his regular season and postseason career bests are also against Jack Del Rio-coached teams, dating back to his days with Jacksonville. Everything is blossoming at the best of times once again for New England, which won its sixth consecutive game to hold steady in the race for the No. 1 seed in the AFC playoffs with the Pittsburgh Steelers, who are also 8-2 after a 40-17 victory over the Tennessee Titans on Thursday. The Patriots game in Pittsburgh on Dec. 17 is continuing to take shape as the de facto championship game of the regular season in the AFC, with the winner having the inside track at homefield throughout the playoffs. In his Brown's Breakdown segment, Troy Brown discusses what it's like to play in high altitude, the improvement of the running game, and he gives his Patriots-Raiders game prediction. New England returns home next week for the first time since Oct. 29 as the Miami Dolphins come to town on Sunday for a 1 p.m. kickoff at Gillette Stadium.